Are Competitive Sports Right For Your Child? Many parents worry if competitive sports are right for their child, and there are just as many reasons for their worry. Maybe the neighbor kid seems to have more natural athletic ability; perhaps the parent had a poor experience with competitive sports or no experience at all; maybe the child’s disposition seems too sweet or fragile for the aggression displayed on the court. Before you can say “hoop dream,” parents will analyze the competitive sports option in a million different ways and for a million different reasons – and that’s okay, they are parents trying to do right by their children. Before the little things, like playing time and favoritism, get in the way, start at point A – is your child developmentally prepared for their sport? Next, look at what benefits kids can get out of competitive sports in the long run – look at the big picture; and lastly, find out how to proceed with caution. IS YOUR CHILD PHYSICALLY, MENTALLY, AND EMOTIONALLY READY? Each child develops at a different rate and according to HealthyChildren.org, are more likely to enjoy and succeed in sports when they have the physical, mental and social skills required by the sport. It may ease parents’ mind to help guide their child to a sport that’s proven to be appropriate for their child’s age. There are several organized activities children can do at almost every age that can contribute to their success in other sports down the road. Here’s a list of a few sports appropriate for different age groups. When a parent feels confident the sport their child is participating in is appropriate for their child’s stage of development, it’s important for them to keep focused on the big picture, rather than on details of what happens every practice and game. With all the big picture positive results in view, parents can proceed comfortably, but still with caution. Psychology Today identifies three important aspects of sports participation -intensity, continuity and balance. Parents should look to combine all three. HealthyChildren.org, along with identifying what sports are appropriate for what age, lists several points to help guide parents, including doing research about the program your child will be entering and making sure safety is the priority of that program. Health writer Darlene Zagata explains some of the pitfalls of your child specializing in one sport, supported by the American Academy of Pediatrics. More often than not, children will tell you what’s right for them. Keep an ongoing dialogue with your child about their experience. Are they having fun? Are they interested in learning more? When your child starts to find excuses not to attend practice or no long finds participation any fun, it’s time to rethink their involvement. The culture of a youth sports team is made from more than just the children on the field and their coach. Assistant coaches, team managers and parents all become a part of what will ultimately cultivate the kind of group that can make a significant impact on kids, and the parent-coach relationships are a key element of that group. Any part of this group can be disruptive to the team’s culture, but when the breakdown of culture comes from the poor behavior of parents, it can be especially difficult for a coach to yield their influence, in part, because there are fewer chances at communication. To help prevent parents from becoming disruptive in the first place, youth coaches need to first be proactive in fostering positive parent-coach relationships and in their conveyance of team culture. If parents become disruptive regardless of understanding a culture that doesn’t stand for that kind of behavior, coaches should seek to have a better understanding of the parent’s position before making up their mind on how to react. There are several ways to start the season off right with parents. The Positive Coaching Alliance (PCA) suggests three techniques to kick-off communication right. Write a letter – This letter sets up expectations for the season. It’s a chance to let parents know your coaching philosophy and the importance of honoring your team culture and the game. This letter lays the foundation for a parent as partner relationship. In this letter coaches can be explicit in their request for parents to respect different aspects of the game including the rules, officials, team members, the sidelines, other parents and of course, coaches. Here, it’s okay to remind parents that they are role models through their actions and responses to the season’s ups and downs. Host a meeting – Pre-season meetings can cover a variety of issues, but it’s good to reserve some time to talk about the coach’s goals as well as parents’ goals for the season. Recruit parents to be part of the team culture by asking for volunteers for snacks, scorekeeping etc. The PCA suggests assigning a parent as Culture Keeper. The Culture Keeper helps shape the foundation of a positive team experience. Create a Parent Pledge – Similar to the letter, the Parent Pledge states the coach’s philosophy and asks parents to set an example for their child. Specifically, the Parent Pledge asks for parents’ initials next to statements about refraining from negative comments, honoring the game and self-control. Setting expectations in a positive way at the very beginning of the season will hopefully keep parents from becoming troublesome, but of course it isn’t guaranteed to work every time. It’s important to remember that the problem of disruptive parents is not an isolated problem. Unruly parents pop up in all communities, regardless of socioeconomics, race and region. They aren’t mutually exclusive to sports either – negative parents can be found in relation to every kind of youth activity. Even when a parent is disruptive, they are still a valuable source of input. Find a time when emotions aren’t particularly high and invite the parent to have a conversation. Hopefully, communication has happened throughout the season up to this point – getting to know them and their children is important to everyday coaching. Remember that parents should be considered your partner in getting the most of their child and more often than not, a parent just needs to get something off their chest. If needed, coaches should allow themselves time to consider the parent’s position. After that consideration, if a coach feels secure in their own position, they can have the confidence to stand their ground. Coaches need to do what they think is right. Back in January we shared some results of the survey we conducted with Harris Interactive about adults’ views on doping in sport, particularly the Olympics. Considering that in the 3 months since the 2014 Winter Olympic Games in Sochi, the International Olympic Committee has found twelve athletes violated anti-doping rules, this topic is still as relevant as ever. Whenever it becomes public knowledge that an athlete has used performance-enhancing drugs (PEDs), many people worry about the effect that will have on young athletes. How do they respond to seeing their athletic role models cheating in sport and harming their body? To gain insight into how teens respond to cheating in sport, Kat Ulich decided to ask her fellow classmates the same questions we posed to adults in our January survey. The results showed that adults and teens seemed generally to have the same feelings about doping in sport. However, it was interesting to observe those responses which differed among the two groups. 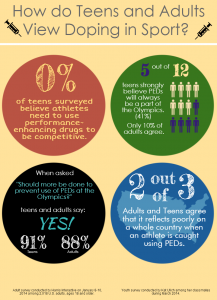 For instance, while less than 50% of adults strongly agree with the idea that more actions needs to be taken to prevent the use of PEDs at the Olympics, 83% of teens strongly agree we need more preventive measures. It seems their differences lie in how vehement in their responses the two groups are, because when combining the “strongly agree” and “somewhat agree” responses to that question, 88% of adults agreed overall, and 91% of teens agreed overall. Check out our infographic below, which illustrates some of the highlights from the surveys.